Friday is the first night of Passover, one of the bigger holidays on the Jewish calendar. I’ve been hosting since before Mom moved to Milwaukee, but since she’s been here there’s no way I’d ever be able to think of not hosting. This will be the first Seder in years I haven’t had at least one of my daughters here. But that doesn’t mean I won’t have a full table. There’ll be 11 of us, including three relatives (parent types) and friends who are part of a Seder community I’ve gathered over the years. There’ll be some new faces at the table, too. I’ve got most of the menu planned, and will spend the next several nights cooking – chicken soup, pignolis and roasting a beet (to sub in for the shank bone on the Seder plate) and a hard-boiled egg. Thursday night I’ll do a bunch of heavy-duty other prep – the charoset (I make Ashkenazic, because I like it!) and whatever else I can get done. I’ve also gathered up the Haggadadot (the books we need to tell the story of the Exodus from Egypt) and my box of plagues, which I’ve been adding to from year to year. A big box of plastic spiders I found on a post-Halloween sale rack will be making their Seder debut this year. 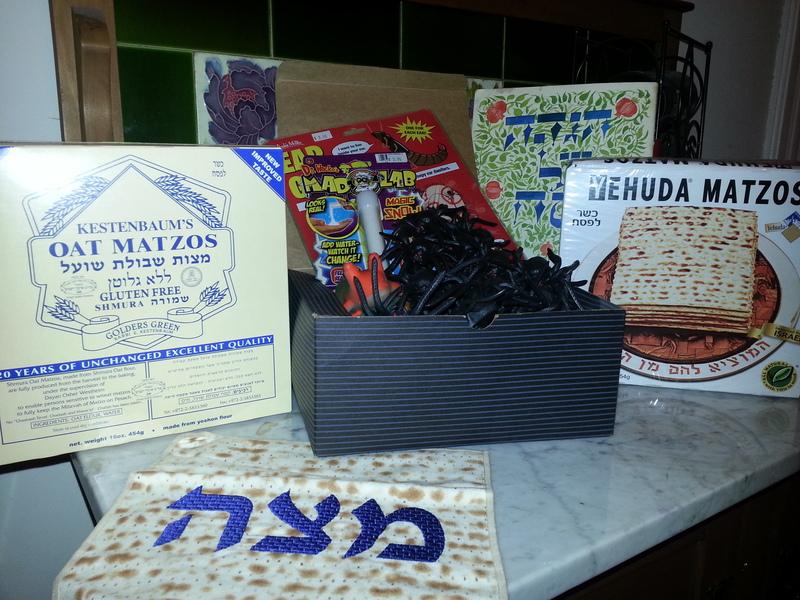 A few Passover things – matzah, matzah cover, a Haggadah and, of course, my Box o’ Plagues! My children’s dad and I split when the girls were 2, 4 and 7. Not surprisingly, his family wasn’t overly thrilled with me after that. Two years later, Ex remarried Dee, a widow with three children. She was also not thrilled with me. We all had that in common, at least. I wasn’t thrilled with me either, though for very different reasons. That was more or less how things stayed, until Ex died in October of 2006. Along with having to deal with being widowed a second time, Dee was dealing with her father’s final illness. So I took to calling my former father-in-law Sidney every week to let him know how his grandchildren were doing, and also to check on how he was doing. That detente led to a genuine friendship, but I wasn’t prepared for what happened in late winter of 2009. “What are you doing for Seder?” he said. “Sidney, would you and Mrs. Sidney like to come to my house for Seder?” I said. I’d started the conversation in one universe and ended it in a parallel one, a universe in which my children’s grandfather and his wife of 30-plus years were driving 75 miles and making a hotel reservation to spend the holiday with the woman who’d divorced his son more than 20 years prior. A few years later, the requests got even more surreal. By the time they stopped, my Seder table was 21 people strong and included my husband, my mother, my children, three of my cousins, Sidney and Mrs. Sidney, Ex’s sister and brother-in-law from Texas, my wife-in-law (if you have a better term for the woman who marries your ex-husband and makes him happier than you did, I’m all ears) and two of her three children, including one who flew in from Israel. There were also the three or four orphans my youngest brought home, along with a friend from synagogue who I was sure would never come back but has every year since. The Passover Seder is a celebration of freedom. Once we were slaves in Egypt, and now we are free. The Mashup Seder celebrated deliverance from a different kind of slavery. At that seder, we moved from a past chained to feelings that had separated and diminished us into one where, together, we celebrated a shared present and a hopeful future. Wow! You’ve got me beat. I have my daughter, my current partner, her mother, her two kids, their godparents, a dear friend and her daughter (to whom I just became guardian), and a couple of other friends. In years past, I’ve also had my ex, but she’s got another Seder this year. I’m all about mashups, and different configurations of family. I find it freeing in a strange way. Really glad to read about your mashup! It was an amazing event, Audrey, and the Texas family is coming next year! I’m excited about it. And Chag Samayach to you and your family, whether bio, chosen or mashup!